The Ronda city is in Malaga Province, Spain. The city is about 100 kilometers from Málaga with a population of 36,315. 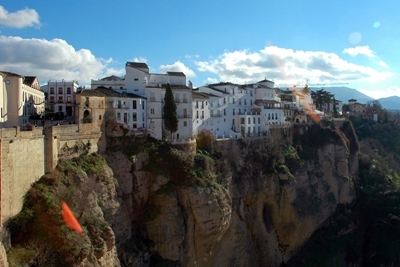 Ronda is one of the best tourist places in Spain with deep gorges and a peaceful atmosphere. The city is located in a mountainous area that is 2,500 feet above the sea level. The River Guadalevin runs in between the city that divides the mountains. It is one of Spain’s oldest bullrings and the field has a diameter of about 220 ft. The ground features 68 arches and two levels of seating. In addition there is a museum here and the entry fee is about €5. One of Spains largest bridges measuring 120 meters. The bridge was built in 1751 and features a chamber below the arch that was used for a number of purposes, as a prison and museum. Meaning “old bridge” measures 120 meters. The bridge was built in the year 1616, it carries pedestrian traffic. It is the main street in the city. It features a number of shops, cafes, bar and restaurants. This park is located close to the bullring and features shady trees and walking space. It is Ronda’s oldest district. It features a museum, Santa Maria Church and a mosque built in the period of Moorish rule. what is wrong with this picture there is some small dots of light at the bottom right hand corner? This was helpful but it could use a bit more information to make this an even more helpful site to go to.